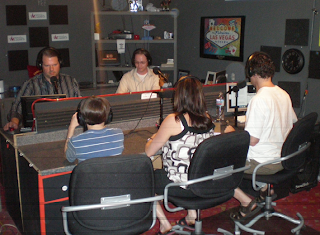 Here we are with 12-year-old Kyle Stokely in the LVRocks.Com studio on Tuesday for this week's program with his mom, Jess. Kyle talks about his life as an original "Love" performer and also about how stuck up Paris Hilton was and how nice Paul McCartney is. That's Engineer Mark behind the mike in the photo below. 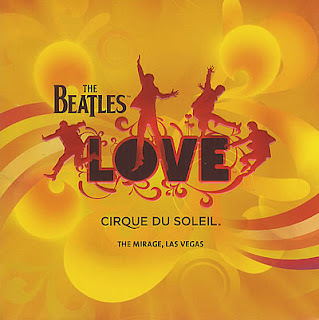 Two years ago this week, the world experienced the Beatles music in a new way, the Cirque du Soleil way. The show “Love” arrived in the theater formerly occupied by Siegfried & Roy to rave reviews and its soundtrack of tracks remixed from the original tapes by the original producer, went on to win a Grammy. 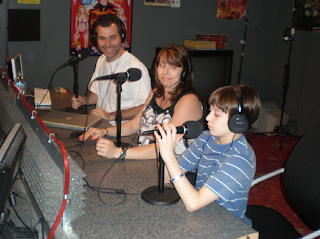 To honor the show, we’ll talk live in the studio tonight to Kyle Stokely, a 12-year-old actor who has been in the production from the beginning about what it’s like being a child actor on the Strip and about all the famous people he’s met on the job. In Banter: The New Yorker's Adelson opus, Cosmo v Cosmo, Trump in the dumps, Cirque gossip and a "locals" Sahara? Did the Viva Vision folks READ the lyrics?!? In 1989, the middle of my three sisters married the wrong guy. She was pregnant, my father was a traditionalist -- which is odd since he'd go on to pay for a lavish gay wedding a decade later that ALSO ended badly -- and several unhappy years came to pass. Well, that and two terrific kids, but that's besides the point. It's been a tradition in my family for my mother and, often, my youngest sister to sing for guests at weddings. Both are talented; my youngest sister was a finalist for the lead role of "Annie" on Broadway in the late 1970s and a former Miss Pee Wee New York or something like that. Anyhow, here's the odd thing: Lynn chose to sing "The Words Get In The Way" by Gloria Estefan, a tune about doomed love and bad communication. Which is really a very inappropriate -- and yet, as it turned out, prescient -- song to choose for a wedding reception. 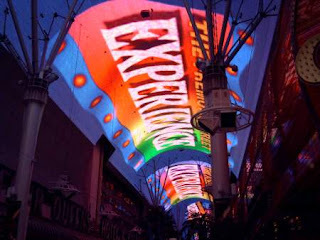 This came to mind when Troy in Las Vegas pointed my attention to a press release trumpeting the special Fourth of July weekend edition of the Fremont Street Experience's Viva Vision show under the downtown metal canopy to be set to that classic tribute to the U.S. of A., "American Pie" by Don McLean. Did I say tribute? Right, sorry. I meant, indictment. A brilliant one, indeed. I love the song. We even analyzed the lyrics in Nina Wolff's 10th grade English class as an example of modern American poetry rich with allusions, literary references and metaphors. Great stuff. LAS VEGAS – June 26, 2008 – Fremont Street Experience premieres "Don McLean's American Pie" Viva Vision light and sound show with a weekend-long 4th of July celebration free to the public, 4 p.m.- midnight July 3-5 in downtown Las Vegas. The world premiere showing of "Don McLean's American Pie" Viva Vision show will open to the public on Thursday, July 3 at 9 p.m., including an opening ceremony hosted by Nellis Air Force Base's Honor Guard and a live performance of the National Anthem. 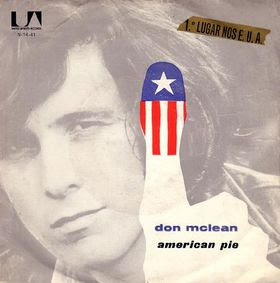 The rock ballad "American Pie", released by Don McLean in 1971, became the anthem for a generation and is still one of the most well- known songs in American musical history. McLean's most famous composition, "American Pie" is a sprawling, impressionistic ballad inspired partly by the deaths of Buddy Holly, Ritchie Valens, and J. P. Richardson (The Big Bopper) in a plane crash in 1959. The song would popularize the expression "The Day the Music Died" in reference to this event. McLean has stated that the lyrics are also somewhat autobiographical and present an abstract story of his life from the mid-1950s until the time he wrote the song in the late 1960s. Uh, yes and no. "American Pie" is a song about how America's best days seemed to be over. You know, the "bye, bye" part? "The day the music died" isn't simply a reference to the Buddy Holly plane crash but a turning point in the good times for America in general. So, sure, that seems like a perfect tune for the Fourth of July! Last night, I had dinner again at Simon in Palms Place. It really is a terrific restaurant and, so I hear, is quickly becoming a popular lunch spot for the power-Vegas set who work on the west side of the Strip. Good for them. No, I -- nor we -- didn't eat it all. In fact, we all sampled this and that and I took home the rest of it. So, hooray, now I have lunch and dinner for a week! Kidding. Sort of. But, you know, $25 for all that is really not a bad deal when split amongst you and your friends. Just a thought the next time you're at the Palms gambling, clubbing or seeing a show at the Pearl. Maybe the Simon menu in general is at the upper end, but this dessert platter isn't. ...and that attracted commentary all over the place about how it is architecturally impossible to have such a waterfall, blah blah blah. ...that the building will be in constant motion. That is, the floors will, uh, spin. Read all about it here. Now, I can't quite see myself getting any rest in a room on the 80th floor of a building that is moving and I can't imagine that they've figured out how to engineer it so that it's not just a constant noisy machine to boot. Also, I'm fascinated that they can build anything that big for $700 million. They must not have unions over there, hmm? But any which way, there was a time when something this bizarre, this freakish could only be conceived and planned for in Las Vegas. 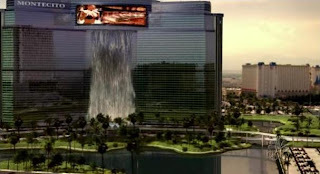 Have Sin City lost its nerve? When I alerted you folks to the 12,000-word piece in the New Yorker by Sheldon Adelson yesterday, I was going a little bit on hype and a little bit on my initial reading of the beginning of it. Connie Bruck, the writer, has a tremendous reputation and fellow journalist friends of mine were calling and emailing to say, "You gotta check this out." OK. So I did. I just spent as long as it took -- two Diet Cokes and a bottle of water, less one understandable potty break -- reading all of it. And I came away underwhelmed. Unlike my issues with Christina Binkley's ridiculous treatment of Adelson and subsequent lame excuses for same in her "Winner Takes All" book, Bruck does an excellent job of giving us a comprehensive lay of the land in Adelsonville. We see him in all his various incarnations, get the basic thumbnail of his life from Boston cabdriver's son to up-and-down entrepreneur to wildly successful Comdex founder to Vegas innovator and rascal to Macau-made billionaire. Along the way, the recurring theme of his interest in all things Jewish and Israeli are detailed. Yes, it's a long piece. Yes, it reads very well. Yes, there are some parts that Adelson might object to, although nothing that seems likely to spawn a lawsuit. But there is actually very, very little that's new in here to anyone with a working knowledge of the Vegas universe. And on that front, I suspect, the New Yorker audience is learning all of this for the first time. So that's fine. But I take back the description from my prior post that this is "fearless" journalism. The vast majority of Bruck's sources appear to be other news reports and legal documents, accessible to anyone who wanted to take the time to collect and reduce it. The most interesting bits that seem to come from her reportage -- two incidents relating to Adelson's alleged interactions with President Bush -- are unsourced and denied or unrecalled by just about everyone involved. And to someone who's fascinated by Vegas, as you who read this blog by definition are, there's not a single word about Adelson's feud with the OTHER Jewish billionaire Vegas visionary, Steve Wynn. If Binkley missed the Adelson angles in her de facto biography of Wynn, Bruck seriously misses the extent to which Steve Wynn has had an influence on Sheldon Adelson. Even the extent of their Jewishness is a significant piece of that rivalry which, I would think would've been of interest to Bruck. So, here's the thing: Is it a surprise to anyone that Adelson can be ruthless, selfish, demanding and ambitious, occasionally stepping over the line of what some might think is ethical? That he gets sued a lot and likes to sue, in both directions sometimes with merit and sometimes seemingly out of spite? That he's an overwhelming, controversial figure in the American Jewish and Israeli world? That he aspires to be even wealthier? The only part of the piece that really made me think in a new way about him was the fascinating passages about his drug-addicted sons from his first marriage. I knew nothing of this, and it struck me as utterly tragic. And his response, to establish drug-treatment facilities and try to set them up with money to carry them through their lives only to be accused by these messed-up ingrates of defrauding them, seemed to suggest a psychodrama at play that I never considered before. I've only ever seen Adelson with his clearly devoted second wife, Miriam, who is a drug-addiction specialist to boot. Her daughter, in fact, is being groomed for a future role in the company and Adelson's sons seem like cute, precocious kids of privilege. Who knows what sort of a father he was, true, but is it weird if I feel some sympathy for him for what he must've gone through with his first boys, one of whom died of an overdose in 2005? What's kind of amazing is that for all that effort and travel, Bruck turns up no specific new complaints about Adelson's behavior that could be actionable or controversial. What I mean is, I know of at least two more lawsuits related to Adelson's Macau adventures that are on the horizon. That's what's next with him. And yet there's no indication, even in all those words about how Adelson got into China, that his legal headaches have hardly ended with the recent judgment against him. Neither does Bruck ever discuss what he's planning to do next in the gaming and business worlds. I also left Bruck's piece with a related question that I didn't expect Bruck to answer but that I am quite curious about: Why hasn't Adelson built anything in Israel? The piece says he's wanted to do an Israeli casino and hasn't been able to, but why not a fancy hotel and convention facility? He's such a booster; where's his investment beyond charities? And if he is so all-powerful over there, how come he hasn't gotten to do the casino? Bruck never really addresses this. There was one bit in this piece that I hadn't heard before that scared the crap out of me, the notion that Adelson might be hot to buy the Las Vegas Review-Journal. It's speculative at best and based largely on his efforts to build a pro-Adelson media base in Israel. The R-J folks tell Bruck they've never fielded an offer, though. But he could so easily do it, and what a disaster that would be for the city. It's not that he'd turn the paper into a right-wing house organ -- to some extent it already is -- but that this town is just too much of a one-trick pony to have one of those pony's chief jockeys also guarding the stables. The Strip is LIVE tonight - w/ LOVE! In honor of the second anniversary of Cirque du Soleil's "Love," we've got the very articulate and talented 12-year-old performer Kyle Stokely live in the studio to discuss his life as a would-be young Beatle. Plus, news from Vegas, a new trivia question, the poll, listener feedback and, as always, The Top Secret Tourist Tip of the Week. Join us at 7-8 pm PT in the chat and listen live at LVRocks.Com. Or wait until Thursday for the podcast version, which will likely include a chat with a second, as-yet-undetermined "Love" actor. The Sahara just became, according to a weird little press release, the "first casino to open a separate players club for locals" that "includes a designated part of the casino floor called Locals Lane." Uh, what? A rundown hotel on the Strip now wants to magically claim to also be a locals joint? Whose brilliant idea was that? Why would anyone go there when they can hang out at one of the Station properties which are nicer, have excellent rewards benefits, are closer and have decades of experience catering to this clientele? Locals Lane will feature machines that have better odds and payback percentages, comparable to those offered in neighborhood casinos. While locals have long been a prized patron of many casinos; the Sahara is the first strip property to openly cater to and reward local gamblers. In the sea of glitzy resort casinos that save the red carpet for the occasional whale or high-roller, the Sahara instantly classifies local gamblers at a VIP status. In conjunction with the designated local’s area, the Sahara has a new “Gold Card” for locals that offers bigger incentives and discounts for meals, shows, drinks, hotel rooms and merchandise. Card members will be treated like royalty at the Sahara, earning immediate access to all “Loyalty Pays” benefits, free gift days, and daily free pulls for a chance to win a $10,000 cash prize. Wow. Times must really, really be tough. What happens if a tourist decides he wants to play on the machines in the Locals Lane because, as this press release admits, those machines are looser? The New Yorker's Connie Bruck did a breathtaking and fearless job taking readers inside the world of Sheldon Adelson in the current issue. Grab yourself a cup of coffee and take it all in here. It's a major piece of work, chiming in at more than 12,000 words. I will do the same and blog more later, but what I've read and heard so far makes it worth your and my full attention. I just wonder if Adelson will leave it alone or sic his attorneys on Bruck and company. God knows, some of the edgier parts of my USA Today piece in January were removed in part out of fear of a lawsuit. For the second year in a row, I covered the always-fascinating annual Casino Chip and Gaming Tokens Collectors Club convention at the Riviera. Here's this year's report, from Sunday's New York Times. Don't miss the priceless closing quote from Christine Smith of Glencoe, Ill.
Trump: Only 15 Percent Closed!?!?! That figure, from Deutsche Bank's gaming analyst Bill Lerner this morning is staggering. He's saying that only 15 percent of units at the Trump condo-hotel in Las Vegas have closed a full three months after it opened. (Normal would be 35 percent if the markets weren't such a mess, he wrote.) This comes one day after Donald Trump himself told Howard Stutz in Sunday's Review-Journal that the new building has seen "roughly" 20 percent of its units close and, really, nobody ought to worry their pretty little heads. After all, he's Trump, right? 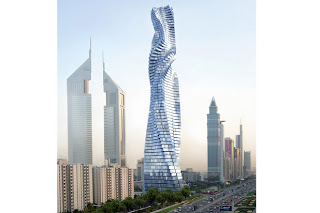 Friess: The first tower is sold out? Schaeffer: The first tower, I do have some select units still available but for the most part, it's close to sold out. So if people are interest, they can still contact us for Tower I. But we are taking reservations for Tower II. Friess: Did you find that any of your first tower folks were unable to get their mortgages because of the market? Schaeffer: Well, we're in the process of closing right now and thus far we haven't really had a problem. Everything's been going pretty smoothly. 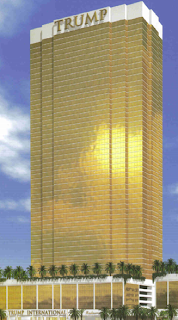 Then again, when you talk about Cosmo and you talk about some of these other projects that stopped mid-construction or even pre-construction, you're not talking about the Trump product and the Trump brand carries again, the Trump name, which pretty much says it all. People know they're getting a level of excellence that is not only unsurpassed anywhere in the world but is something that speaks for itself. So even in a poor market, we've really been relatively unaffected. That's an awfully rosy way of looking at things. "relatively unaffected." Mmmhmm. Hear the whole conversation here. Sure, Trump is correct in partly blaming the underperformance on the economic conditions, but has the market really changed significantly since Schaeffer made these remarks in late March or was she LYING THROUGH HER TEETH? It is telling that Palms Place has been open for only about six weeks and they're 45 percent closed, according to Lerner. Granted, Trump has 1,282 units and Palms Place only has 599, but that still means that in raw numbers Palms Place has closed more units --about 192 for Trump, 270 for Palms. Stutz reported Trump as saying Trump had closed "more than 250" units. If Lerner's figures are correct, Trump was lying to Stutz. But either which way, this building is, thus far, a flop. A lovely flop, from what I've heard, but a flop nonetheless.